ARC'TERYX Alpha FL 30 Backpack. Ultralight and fast, highly weather resistant, alpine strong, and a sterling example of refined, use specific Arc'teryx design, the Alpha FL 30 is for built for climbers. An intense focus on the realities of moving fast in alpine environments led to this versatile, streamlined pack that combines leading edge fabric technologies, performance focused design and a confident simplicity. Every element is carefully considered. Each feature has a specific reason. The pack weighs a mere 585 grams (20.6 ounces) and is optimized to work with other Arc'teryx Ascent products to deliver an ultrafast, ultralight alpine system ready for the harshest conditions. Arc'teryx developed N400-AC2, a unique, highly durable nylon fabric that sheds weather. Polyurethane coated inside and out, the fabric is water, snow and even air impermeable, and its pigmented white interior reflects light for heightened visibility. Working together, the N400-AC2 fabric, taped seams and RollTop closure combine to shut out the elements and protect the pack's contents. With no extraneous materials or aspects, the Alpha FL 30 sheds grams but does not sacrifice necessary features. An external bungee attachment secures tools, crampons, belay parka, helmet or sleeping pad. The traditional top lid has been replaced with a combination of the Arc'teryx RollTop closure and a drawstring collar. 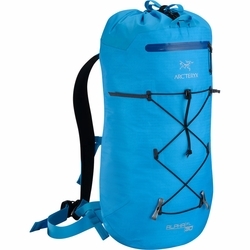 The glove friendly drawstring opening provides ease and speed of access, while the RollTop closure provides a weatherproof seal that, when not needed, tucks inside the pack and out of the way. The RollTop also serves to increase pack volume. A simple strap at the top secures a rope, and the unique laminated shoulder strap construction delivers a comfortable carry without unnecessary weight. An external security pocket stores small essentials.